I thougtht I would share some Spring 2013 trends despite that you have probably seen them elsewhere and I’m a little bit late, but always good for inspiration and simply a few of my favourite looks. 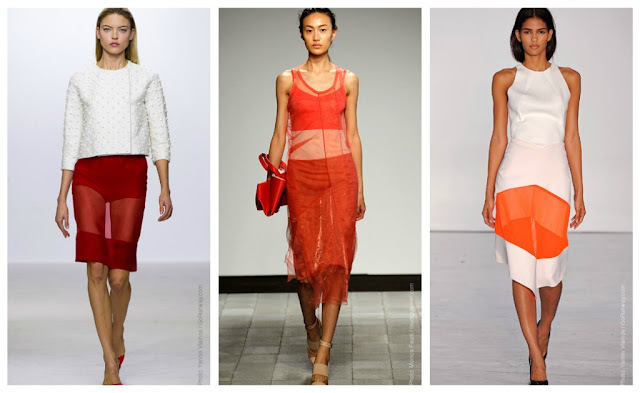 I love the idea of sheer for Spring, especially panelling. Makes me think of my recently DIY’ed maxi skirt in white, with it’s sheer and opaque horizontal stripes. I love the Rochas sheer flowing white skirt above but don’t think I’d be daring enough to pull of a full sheer skirt (where do you wear something like that, anyways?). Although something about each one catches my eye, my fave is definitely Dion’s white and orange dress; simply stunning.